If you are launching a new firm or enhancing the operational efficiency of an existing firm, choosing an external provider to outsource your IT needs is an important decision that should be made after careful consideration and evaluation. To help with the evaluation process, here are our top considerations to keep in mind when evaluating IT providers and which best suits the needs of your firm. When searching for an IT provider, you need to make sure that your IT provider has good availability. If the network does not sleep, neither should your IT support. Look for 24x7x365 availability from the provider. In addition to that, you want to make sure that your IT provider has quick response times. Ensuring that they are responding to emails in a timely manner or returning calls on time is important. What if your firm is in need of help due to an outage and your IT provider was not available? What would you do? Having a provider available 24x7x365 can help you eliminate this concern. By consolidating your IT into one single provider, you can see a reduction of costs. With one provider, you are only dealing with one team, and set of contact points – and that means only one bill. One IT provider saves money and time. Only having one point of contact allows you to cut through the complexity. The increasing complexity of the financial industry—including new regulations and restrictions—requires a greater depth of expertise when it comes to technology. Having everything under one umbrella greatly simplifies all of your IT requirements and reduces cross-over inefficiencies. Your IT provider is only as strong as the services it provides. Does the IT provider offer all of the solutions and services necessary to encompass all aspects of the technology foundation required to help your firm operate effectively and efficiently? 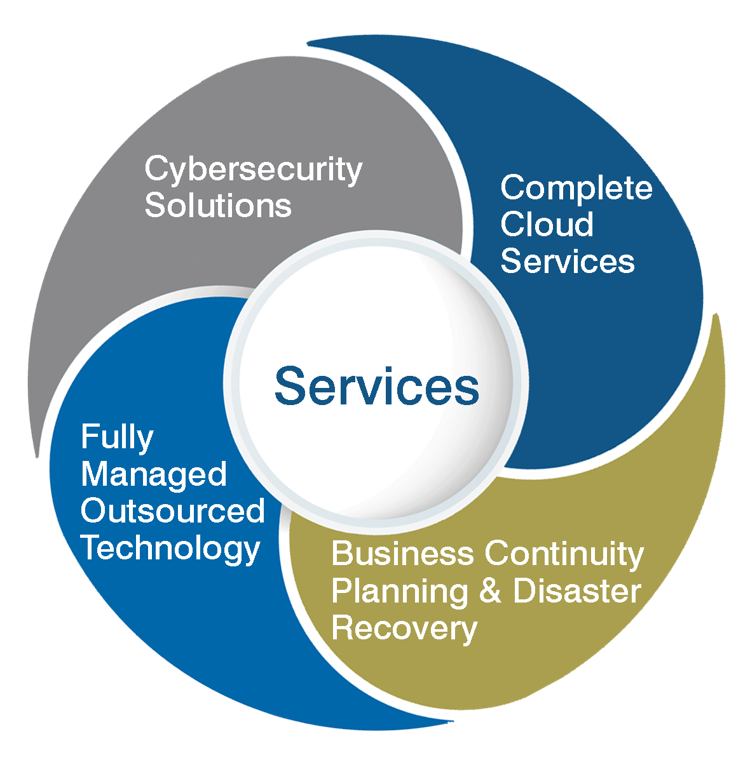 These can vary depending on your firm’s specific business requirements, but may include such solutions as cloud services, cybersecurity, backup & recovery services, business continuity planning, disaster recovery, email & IM archiving, telecom services, application hosting, consulting and project management. When selecting an outsourced IT provider, it is crucial to understand who you will potentially be working with. Is the organization led by a seasoned, reputable management team? Do they employ a skilled technical staff of engineers and analysts to assist with all stages of your infrastructure build-out and maintenance? What pertinent technical certifications do they hold? In addition to ensuring that the provider has a top-quality team, it is also important to note the depth of that staff. In other words, do they have a team of engineers and analysts that is large enough to ensure that someone will be available to assist you 24x7x365 if necessary? Choosing an IT provider is no easy task, and we strongly urge you and your firm to take a proactive approach and do an in-depth evaluation. Asking questions and interviewing multiple providers will allow you and your firm to find the best fit for your IT needs. Contact an Eze Representative today to see if we best fit your firm’s needs.